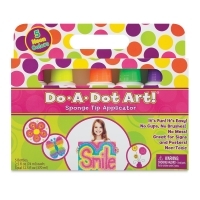 Every kid can make pointillist masterpieces with Do-a-Dot Art Markers — the original dot art markers! 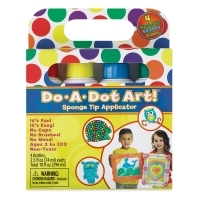 With large, round, spongy tips, young artists can apply dots of paint in various patterns to form images or blend colors to create their own exciting designs. 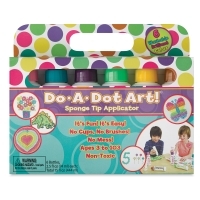 No-drip, no-spill Do-A-Dot Art Markers eliminate the need for messy paint cups, brushes, and water dishes. 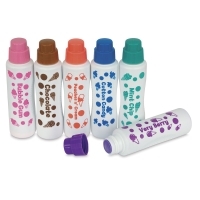 They’re washable, made with a special non-clogging formula that won't dry out, even if the markers are left uncapped. 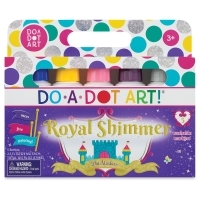 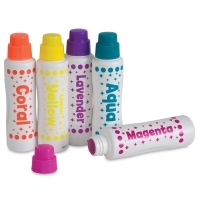 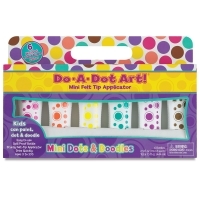 Do-A-Dot Art Markers are 5" long and contain 2.5 oz (74 ml) of paint. 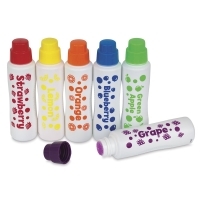 The easy-to-grip bottles are great for little hands. 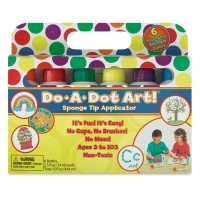 Suitable for artists ages 3 and up. 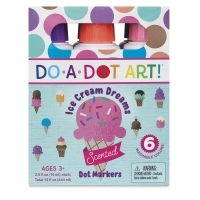 Scented Ice Cream Dreams, Set of 6 — For art that smells as good as it looks! 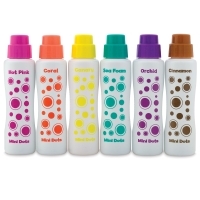 This delicious set includes Bubble Gum, Chocolate, Cotton Candy, Mint Chip, Peaches n' Cream, and Very Berry scented markers. 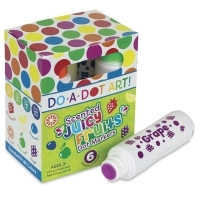 Scented Juicy Fruits, Set of 6 — Great for creative sensory play, this set includes Blueberry, Grape, Green Apple, Lemon, Orange, and Strawberry scented markers. 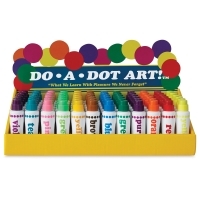 Class Pack, Set of 25 — Perfect for a classroom of young artists, this 25-piece set includes two markers each of Red, Blue, Green, Yellow, Orange, and Purple and one each of Pink, Teal, Violet, Lime Green, Sunflower Yellow, Coral, Brown, Black, Shimmer Silver, Shimmer Yellow, Shimmer Pink, Shimmer Purple, and Shimmer Blue. 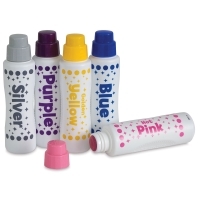 Royal Shimmer Colors, Set of 5 — Shimmering special effects are in store with this set of five markers including Shimmer Silver, Shimmer Pink, Shimmer Blue, Shimmer Purple, and Shimmer Yellow. 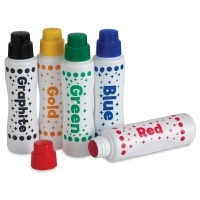 Rainbow Colors, Set of 6 — The colors of the rainbow are included in this set of six colors: Red, Orange, Yellow, Green, Blue, and Purple. 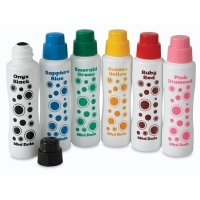 Mini Marker Jewel Tones, Set of 6 — These markers have a smaller mini tip and come in six brilliant colors including Sapphire Blue, Emerald Green, Golden Yellow, Ruby Red, Pink Diamond, and Onyx Black. 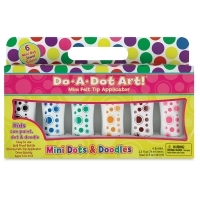 Class Pack, Set of 72 — This convenient bulk set of Do-a-Dot markers is great for the classroom. 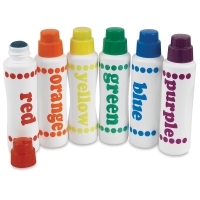 It includes six markers each of Purple, Red, Orange, Yellow, Green, Blue, Violet, Pink, Teal, Green, Brown, and Black. 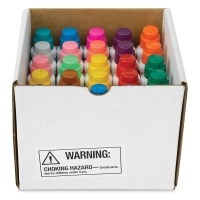 The markers come in a handy display box for storage. 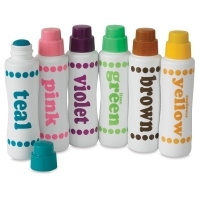 Mini Marker Island Brights, Set of 6 — This set includes Lavender, Sea Foam, Lemon, Coral, Magenta, and Cinnamon Brown markers with a smaller mini tip. 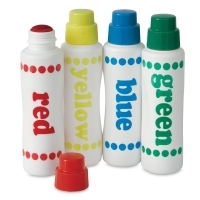 Rainbow Colors, Set of 4 — This set includes one marker each of Red, Yellow, Blue, and Green. 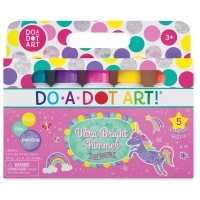 Ultra Bright Shimmer Colors, Set of 5 — This set includes shimmering Aqua, Coral, Lavender, Lemon Yellow, and Magenta markers. 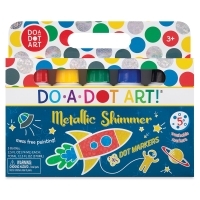 Metallic Shimmer Colors, Set of 5 — This set includes shimmering Blue, Gold, Graphite, Green, and Red markers. 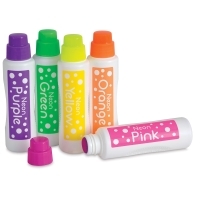 Neon Colors, Set of 5 — This set includes vivid Neon Green, Neon Orange, Neon Pink, Neon Purple, and Neon Yellow markers. Brilliant Colors, Set of 6 — This set of six bold and brilliant colors includes Teal, Violet, Lime Green, Pink, Sunflower Yellow, and Brown.